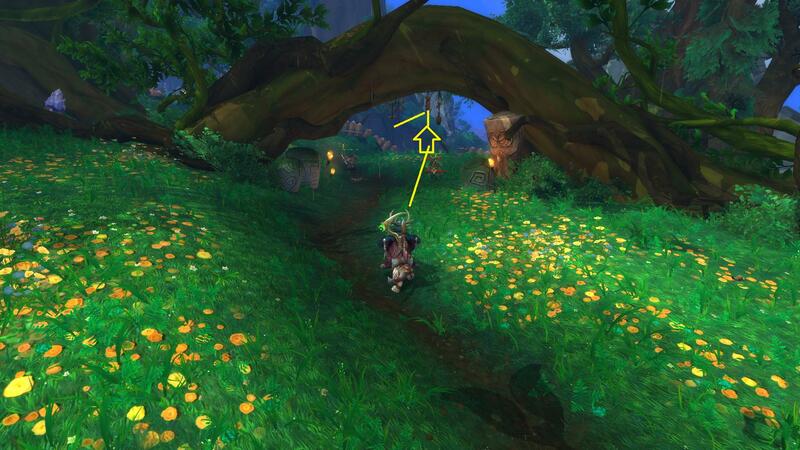 The blue area marker on the map makes it look like it has something to do with a series of Furbolg around a pillar. In reality there is a Satyr in a cave beneath the camp. The way down to the cave is just next to the entrance to the Furbolg camp. If you're having issues finding where to go.. Maybe these screenshots will help. Like Themuffinman311 said above, its straight through the entrance to the camp. And voila! There he is! How do you pick this quest up? Are there any prereqs? I went to where the NPC is supposed to be and there's nothing there. Cave entrance 67.7, 76.2, south and down a hill from the circle of fighting Hipocapeta Ensandecidos. Use your Caminhar no Sonho spell to turn in the quest in the O Bosque Onírico zone. If you are like me and can not find the start to this quest. Rensar Greathoof (weapon guy) starts the quest line once you hit 103. At 66.56 76.44, the path splits. Go left for the grell part of the quest, and right to get the Idol of the Wild from Kalazzius the Guileful. He's in a cave at the bottom of the right-hand path at 67.6 75.9. Ignore the blue spot on the map where all the grells and furbolgs are duking it out, that isn't the right place to get the Idol. I was lost and couldn't figure out how to start this quest chain. You are likely looking for Pegada do Pesadelo, which starts in the middle of Val'sharah for whatever reason. I think it becomes available after completing a quest in your order hall, but there's no breadcrumb quest to actually take you out into Val'sharah, so you can miss it if you're not reading quest text. 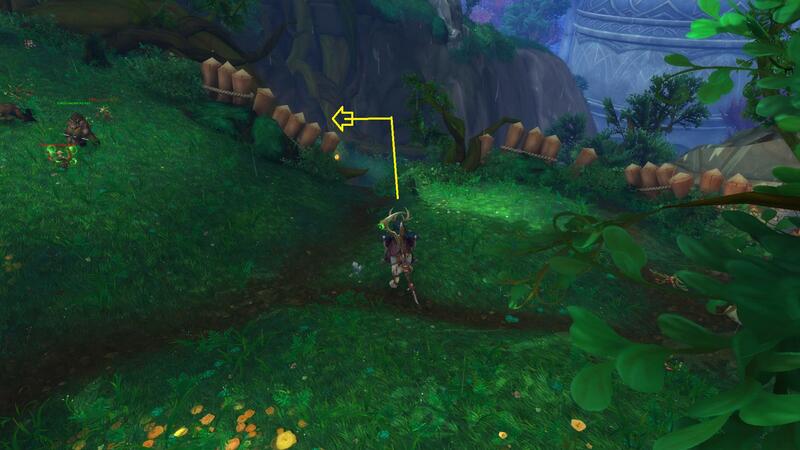 As you picked up the quest, cross a bridge nearby and travel to 64.6 74.2 spot, there's a path through rocks starts. Follow the path (heading to Grizzleweald) and turn right road as the path splits (you can turn left and jump down from cliffs as well), there you'll see a cave at 67.6 76.2 spot. Kalazzius, o Dissimulador is inside the cave, he drops Ídolo do Selvagem. If you can't find where to start this quest you might want to trace your steps back and see if Broll Mantursino at 57.0 71.2 in Val'sharah has a ! over his head. Broll Mantursino gives Pegada do Pesadelo that ends by Sylendra Verdecanto standing close by. She has the follow up Rastreamento do inimigo which leads to Ídolo das Selvas when finished. Took me long time trying to track back on the different quests and questchains to find what step I was on and stumbles on this info by pure luck. If you were like me, I came here looking for comments on why I wasn't getting credit for attacking the Satyrs. Ataque 6 Sátiros Demonero e consiga informações sobre o Ídolo das Selvas. Conseguimos arrancar uma confissão desse aqui. Sabemos que o líder deles levou o ídolo para o Vale Garralua, mas esse líder pode estar escondido em qualquer lugar. Com certeza um desses sátiros saberá para onde o ídolo foi levado. Tire a informação desses sátiros, nem que seja a última coisa que eles farão. Você recuperou o Ídolo das Selvas? O Ídolo... Sinto um alívio enorme ao vê-lo nas suas mãos, <name>. Vamos mantê-lo aqui no Bosque Onírico por segurança.